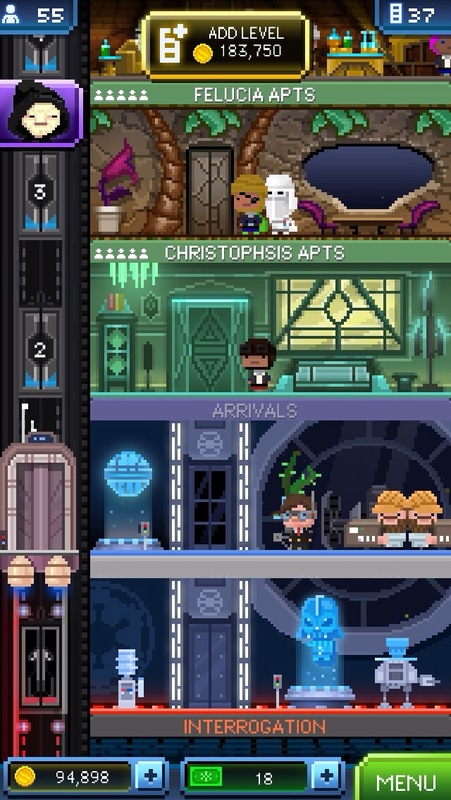 The tip-top of my Tiny Tower. 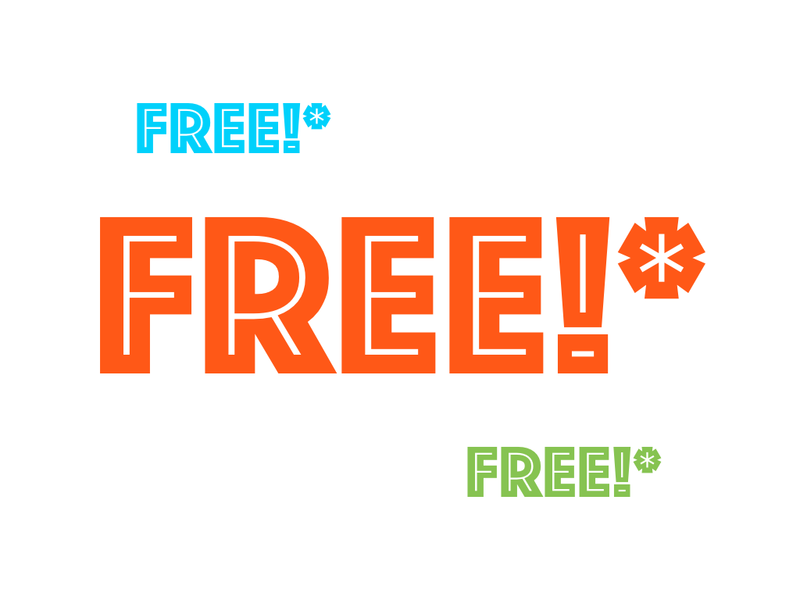 The purpose of the game is to build a tower up to the heavens, filling it with shops and apartments full of “bitizens”. The 8-bit graphics are almost terminally cute, and there’s a quirky sense of humour at work, but just how much game is there here? The game itself runs on two currencies. The first, money, is used to build floors and stock shops and can be gained through selling goods from those shops and giving lifts to bitizens. The second currency, towerbux, is used throughout the game to speed up the sometimes slow process of stocking floors and gaining new bitizens, as well as to spruce up floors with new paint jobs and bitizens with costumes. Importantly, players can purchase towerbux for real money, which is where the profit part of the equation comes in for the developer NimbleBit. It’s perfectly possible to play without ever paying for towerbux, and the more attention you pay to the game, the more towerbux you’ll pick up from in-game sources, such as completing tasks and fully stocking floors, but in order to make towerbux an attractive option, the game has to tweak players’ impatience, and it does so by getting slower and harder to build floors as it goes along. 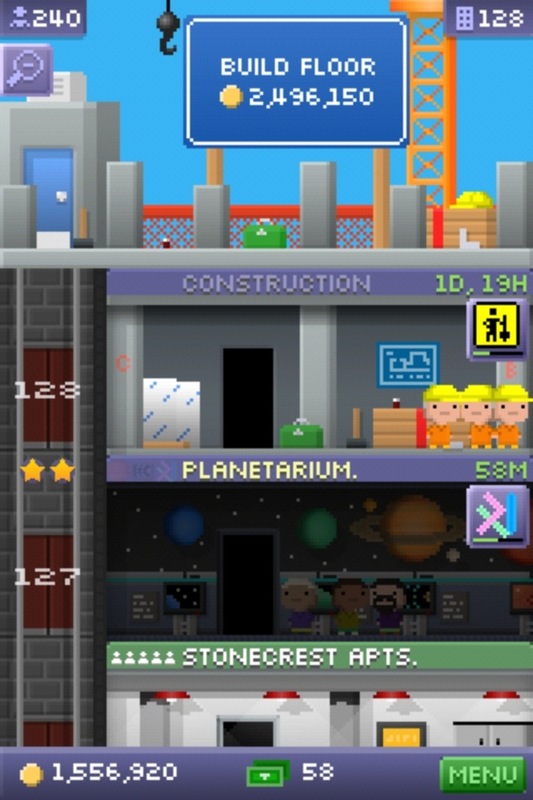 Most of the fun to be had with Tiny Tower comes early in the game, when you get to add a few new floors every day. There’s a basic community element too, which uses iOS’s Game Center to show your friends’ progress. However, as the pace of the game slows (at the moment, I get a new floor slightly faster than every other day) there’s not much attachment to your tower or bitizens to keep you coming back. Worse, the ability of towerbux to speed your progress diminishes, making them less appealing right at the moment a player might want them most. There was a lot of fuss not long ago about Zynga’s decision, after being rebuffed in an attempt to buy NimbleBit, to simply copy Tiny Tower wholesale for their own game Dream Heights. 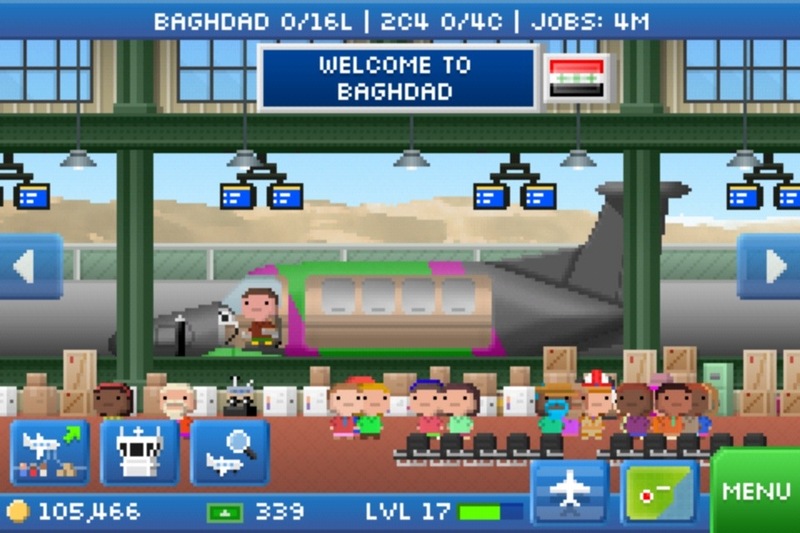 Whatever the rights and wrongs of that kerfuffle, I can’t help feeling that NimbleBit missed a trick. Tiny Tower was the iOS game of 2011, but the two main wikis on it haven’t been kept properly updated. Perhaps selling at the height of the market might have been a good idea? At the moment, this obsessive-compulsive completist is still playing, mostly because I want to get all the available floors. Which, at my current rate of progress, will take perhaps two more months, assuming that NimbleBit don’t release yet another update adding a batch of new floors. Is it really a game? I’m not sure, but I’ve had fun with it. I’m just not sure that I’m still having fun with it.